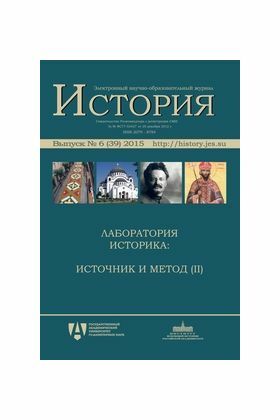 The present issue of the electronic journal “History” consists of papers sent to the editorial board in the late 2013 — the early 2015. The papers are dedicated to various problems and periods: from the late Antiquity to the early 20th century, and from the archaeology of the Sarmathians to modern international relations. For the purposes of convenience we allocated the articles in chronological order. Nevertheless, it seems important to indicate three groups of papers which have a special origin. Firstly, these are papers written as proceedings of a round table “Ethnic groups, peoples, and nations in Europe and Russia from the Middle Ages until the present day”, held in the Historical Faculty of the State Academic University for Humanities on March, 22, 2012 (organizers: Alexey Bakanov and Sergey Denisov). These include articles by S. A. Denisov, Yu. Ya. Vin and T. A. Belyakova. Secondly, in 2014 a volume of articles appeared in a small run of copies, dedicated to the anniversary of Marina V. Vinokurova, a member of the editorial board of the present issue (Istochnikovedcheskie issledovanija / ed. by Samuil Volfson and Timofey Guimon. Moscow 2014. Vol. 6). We considered it possible to place here upgraded versions of some of the papers of that volume. These are articles by M. V. Zemlyakov, M. M. Drobysheva, T. V. Guimon and L. M. Orlova-Guimon, E. A. Prusskaya, P. A. Datsenko, N. V. Kovalenko. Thirdly, several papers concerned with religion and church in Russia in the late 19th and the early 20th century have been collected for this issue by Aleksey Beglov and Nadezhda Belyakova, to whom we are very grateful. These are papers by A. L Beglov, V. B. Aksenov, N. I. Potapova, A. V. Mazyrin, N. A. Belyakova. How did the fortress Kazikermen look in 1695?